Decorative Leaded Transom Panel in a Hall, Horley, Surrey. I made this leaded light with the same lead pattern as some windows already existing in the house. 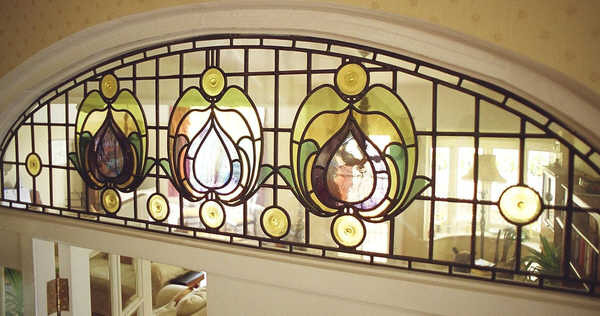 The glass used in these is not as bright in colour as the originals to allow as much light as possible into the hall. The window includes some beautiful mouth blown streaky antique glass in the centres and traditional spun roundels. This client required a window over the living room door which would compliment existing lead lights in the bay window. I took a rubbing of the original glass which gave me very accurate lead lines and chose glass with subtle colours, the original being very bright. The result is a window which looks as if it was made with the house and very happy clients! Error: Error validating access token: Session has expired on Monday, 08-Apr-19 03:56:55 PDT. The current time is Friday, 19-Apr-19 12:14:11 PDT.